“Real Estate Investing: How to Find Cash Buyers and Motivated Sellers” teaches real estate investors and those interested in learning to invest in real estate how to define and target ideal cash buyers and motivated sellers. The book covers absentee owners, rehab investors, Section 8 landlords, and other buyer types. Some of the marketing topics include mailing lists, postcards, both online and offline marketing strategies along with examples. 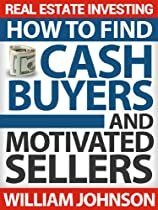 Anyone who wants to wholesale a house or is curious about flipping houses should pick this book to get educated on cash buyers and motivated sellers for their real estate investing.